“USMC” redirects here. For other uses, see USMC (disambiguation). Gen. John M. Paxton, Jr.
Two battalions of Continental Marines were formed on 10 November 1775 in Philadelphia as a service branch ofinfantry troops capable of fighting for independence both at sea and on shore. The role of the Corps has since grown and evolved, expanding to aerial warfare and earning popular titles such as, “America’s third air force”, and, “second land army”. 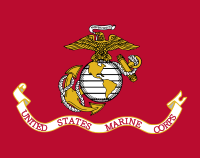 The United States Marine Corps has distinguished itself as it has served in the majority of American wars and armed conflicts, from its inception to the modern era, and attained prominence in the 20th century when its theories and practices of amphibious warfare proved prescient and ultimately formed the cornerstone of the Pacific theater of World War II. By the mid-20th century, the U.S. Marine Corps had become a major theorist of and the world’s dominant practitioner of amphibious warfare. Its ability to rapidly respond on short notice to expeditionary crisesgives it a strong role in the implementation and execution of American foreign policy. As of 2016, the USMC has around 182,000 active duty members and some 38,900 reserve Marines. It is the smallest of the U.S. armed forces within the U.S. DoD. This last clause, while seemingly redundant given the President’s position as Commander-in-chief, is a codification of theexpeditionary responsibilities of the Marine Corps. It derives from similar language in the Congressional acts “For the Better Organization of the Marine Corps” of 1834, and “Establishing and Organizing a Marine Corps” of 1798. In 1951, the House of Representatives’ Armed Services Committee called the clause “one of the most important statutory – and traditional – functions of the Marine Corps.” It noted that the corps has more often than not performed actions of a non-naval nature, including its famous actions in Tripoli, the War of 1812, Chapultepec, and numerous counter-insurgency and occupational duties (such as those in Central America), World War I, and the Korean War. While these actions are not accurately described as support of naval campaigns nor as amphibious warfare, their common thread is that they are of an expeditionary nature, using the mobility of the Navy to provide timely intervention in foreign affairs on behalf of American interests. In addition to its primary duties, the Marine Corps conducts Visit, board, search, and seizure (VBSS) operations, as well as missions in direct support of the White House and the State Department. The Marine Band, dubbed the “President’s Own” byThomas Jefferson, provides music for state functions at the White House. Marines from Ceremonial Companies A & B, quartered in Marine Barracks, Washington, D.C., guard presidential retreats, including Camp David, and the Marines of the Executive Flight Detachment of HMX-1 provide helicopter transport to the President and Vice President, with the radio call signs “Marine One” and “Marine Two”, respectively. The Executive Flight Detachment also provides helicopter transport toCabinet members and other VIPs. By authority of the 1946 Foreign Service Act, the Marine Security Guards of the Marine Embassy Security Command provide security for American embassies, legations, and consulates at more than 140 posts worldwide. The relationship between the Department of State and the U.S. Marine Corps is nearly as old as the corps itself. For over 200 years, Marines have served at the request of various Secretaries of State. After World War II, an alert, disciplined force was needed to protect American embassies, consulates, and legations throughout the world. In 1947, a proposal was made that the Department of War furnish Marine Corps personnel for Foreign Service guard duty under the provisions of the Foreign Service Act of 1946. A formal Memorandum of Agreement was signed between the Department of State and the Secretary of the Navy on December 15, 1948, and 83 Marines were deployed to overseas missions. During the first year of the MSG program, 36 detachments were deployed worldwide. 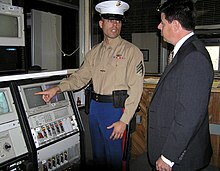 The Marine Corps was founded to serve as an infantry unit aboard naval vessels and was responsible for the security of the ship and its crew by conducting offensive and defensive combat during boarding actions and defending the ship’s officers from mutiny; to the latter end, their quarters on ship were often strategically positioned between the officers’ quarters and the rest of the vessel. Continental Marines manned raiding parties, both at sea and ashore. America’s first amphibious assault landing occurred early in the Revolutionary War on 3 March 1776 as the Marines gained control of Fort Montague and Fort Nassau, a British ammunition depot and naval port in New Providence, the Bahamas. The role of the Marine Corps has expanded significantly since then; as the importance of its original naval mission declined with changing naval warfare doctrine and the professionalization of the naval service, the Corps adapted by focusing on formerly secondary missions ashore. The Advanced Base Doctrine of the early 20th century codified their combat duties ashore, outlining the use of Marines in the seizure of bases and other duties on land to support naval campaigns. Throughout the late 19th and 20th centuries, Marine detachments served aboard Navy cruisers, battleships and aircraft carriers. Marine detachments (generally one platoon per cruiser, a company for battleships or carriers) served in their traditional duties as a ship’s landing force, manning the ship’s weapons and providing shipboard security. Marine detachments were augmented by members of the ship’s company for landing parties, such as in the First Sumatran Expedition of 1832, and continuing in the Caribbean and Mexican campaigns of the early 20th centuries. Marines would develop tactics and techniques of amphibious assault on defended coastlines in time for use in World War II. During World War II, Marines continued to serve on capital ships. They often were assigned to man anti-aircraft batteries. When gun cruisers were retired by the 1960s, the remaining Marine detachments were only seen on battleships and carriers. Its original mission of providing shipboard security finally ended in the 1990s as the battleships were retired and nuclear weapons were withdrawn from deployment on aircraft carriers. U.S. Marines from the 31st Marine Expeditionary Unittraining in amphibious warfareduring Operation Talisman Sabre at Shoalwater Bay in Australia. The Marine Corps relies on the Navy for sealift to provide its rapid deployment capabilities. In addition to basing a third of theFleet Marine Force in Japan, Marine Expeditionary Units (MEU) are typically stationed at sea. This allows the ability to function as first responders to international incidents. The United States Army maintains light infantry units capable of rapid worldwide deployment, but those units do not match the combined-arms integration of an MAGTF and lack the logistics that the Navy provides. Therefore, the Marine Corps is often assigned to non-combat missions such as the evacuation of Americans from unstable countries and providing humanitarian relief during natural disasters. In larger conflicts, Marines act as a stopgap, to get into and hold an area until larger units can be mobilized. The Corps performed this role in World War I and the Korean War, where Marines were the first significant combat units deployed from the United States and held the line until the country could mobilize for war. To aid rapid deployment, the Maritime Pre-Positioning System was developed: fleets of container ships are positioned throughout the world with enough equipment and supplies for a Marine Expeditionary Force to deploy for 30 days. The United States Marine Corps traces its institutional roots to the Continental Marines of the American Revolutionary War, formed by Captain Samuel Nicholas by a resolution of the Second Continental Congress on 10 November 1775, to raise twobattalions of Marines. That date is regarded and celebrated as the date of the Marine Corps’ birthday. At the end of the American Revolution, both the Continental Navy and Continental Marines were disbanded in April 1783. The institution itself would not be resurrected until 11 July 1798. At that time, in preparation for the Quasi-War with France, Congress created the United States Marine Corps. Marines had been enlisted by the War Department as early as August 1797 for service in the new-build frigates authorized by the Congressional “Act to provide a Naval Armament” of 18 March 1794, which specified the numbers of Marines to be recruited for each frigate. The Marines’ most famous action of this period occurred during the First Barbary War (1801–1805) against the Barbary pirates, when William Eaton and First Lieutenant Presley O’Bannon led eight Marines and 500 mercenaries in an effort to capture Tripoli. Though they only reached Derna, the action at Tripoli has been immortalized in the Marines’ hymn and theMameluke Sword carried by Marine officers. During the War of 1812, Marine naval detachments took part in some of the great frigate duels that characterized the war, which were the first and last engagements of the conflict. Their most significant contribution, however, was holding the center of General Jackson‘s defensive line at the Battle of New Orleans, the final major battle and most one-sided engagement of the war. 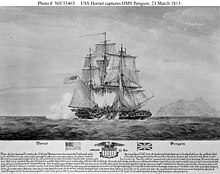 With widespread news of the battle and the capture of the HMS Cyane, HMS Levant and HMS Penguin, the final engagements between British and American forces, the Marines had acquired a well-deserved reputation as expertmarksmen, especially in defensive and ship-to-ship actions. After the war, the Marine Corps fell into a malaise that ended with the appointment of Archibald Henderson as its fifth Commandant in 1820. Under his tenure, the Corps took on expeditionary duties in the Caribbean, the Gulf of Mexico, Key West, West Africa, the Falkland Islands, and Sumatra. Commandant Henderson is credited with thwarting President Jackson’s attempts to combine and integrate the Marine Corps with the Army. Instead, Congress passed the Act for the Better Organization of the Marine Corpsin 1834, stipulating that the Corps was part of the Department of the Navy as a sister service to the Navy. This would be the first of many times that the existence of the Corps was challenged. 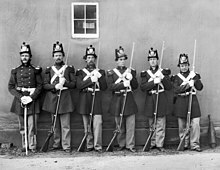 With their vast service in foreign engagements, the Marine Corps played a moderate role in the Civil War (1861–1865); their most prominent task was blockade duty. As more and more states seceded from the Union, about a third of the Corps’ officers left the Union to join the Confederacy and form the Confederate States Marine Corps, which ultimately played little part in the war. The battalion of recruits formed for the First Battle of Bull Run (First Manassas) performed poorly, retreating with the rest of the Union forces. Blockade duty included sea-based amphibious operations to secure forward bases. In late November 1861, Marines and sailors landed a reconnaissance in force from theUSS Flag at Tybee Island, Georgia, to occupy the Lighthouse and Martello Tower on the northern end of the island. It would later be the Army base for bombardment of Fort Pulaski. Saudis Turn Their Backs on Oil The world’s greatest genius is well-known for his work behind the television, lasers, remote controls, and DVDs.